In 2019, the Crawford Path, a footpath that runs eight and a half miles from US Route 302 in New Hampshire to the summit of Mount Washington, will be 200 years old. It is the oldest hiking trail in continuous use in the United States. 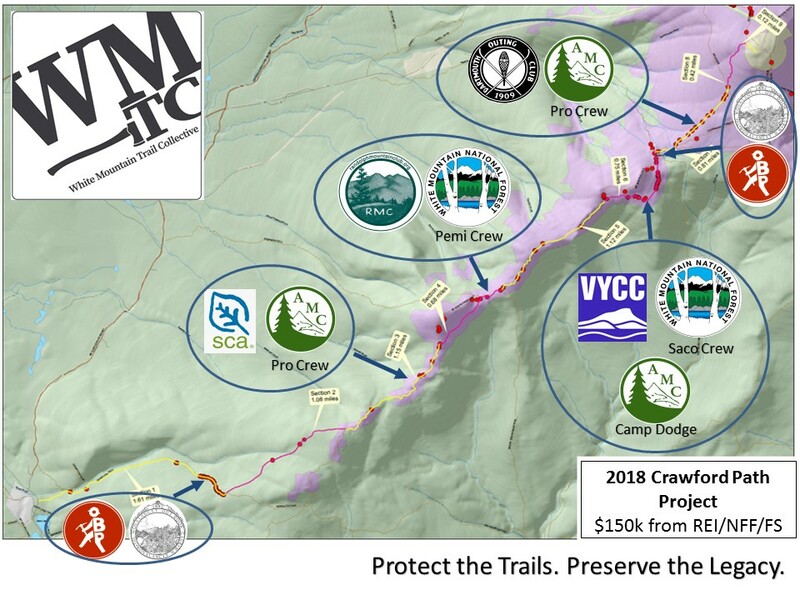 Thanks to a generous gift from REI donated to the National Forest Foundation, a $150,000 grant has been made available to perform much needed work on Crawford Path. Currently, there are a variety of issues requiring attention on Crawford Path including social trails (these cause significant environmental damage), erosion, and areas with standing water. The collective impact model is being used to assemble a trail team - the first of its kind - comprised of traditional trail clubs, volunteer groups, and the United States Forest Service. We are confident that this model offers the best chance moving forward to save our treasured White Mountain region trails. 2018 is the Centennial Anniversary of the White Mountain National Forest. There could not be a better way to celebrate this than assembling an unprecedented team and taking on Crawford Path. Featured on this page is the 2018 project map. It lists all the partners involved in the project. In alphabetical order, they include Appalachian Mountain Club, Dartmouth Outing Club, National Forest Foundation, Off the Beaten Path Trailworks, LLC, Randolph Mountain Club, REI, Student Conservation Association, USFS Pemigewasset District Crew, USFS Saco District Crew Vermont Youth Corps, White Mountain Trail Collective, and the Wonalancet Outdoor Club. There will also be involvement by volunteers and we will be posting volunteer events as soon as we have a schedule. See our Volunteer page above for events. Despite the generous support of REI, there are still funds needed to complete the project. We estimate an additional $100,000 will be needed to complete the work in 2019. We are currently fundraising for this effort. Please visit the contribute page and donate today. What better way to celebrate the centennial than contributing with funding or boots on the ground volunteer work? The White Mountain Trail Collective is convening a projects working group to determine what project(s) we could undertake in 2020. We need to have projects identified, a logistical plan, and funding in place in 2019 to execute any significant project in 2020. Send in your suggestions on the next trail(s) that could benefit from a collective impact approach.